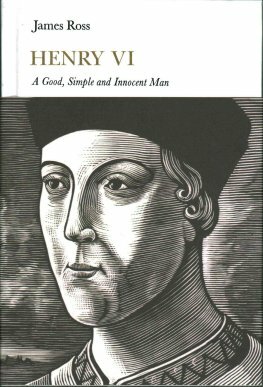 Summary: Concise, well-researched, and readable history of Henry VI, described as a "Good, Simple and Innocent Man" but utterly unsuited to kingship. James Ross both tells the sad, tragic story of this Lancastrian monarch and critiques historians' interpretations of his long reign. From the first sentence of this new biography in the Penguin Monarchs series, James Ross introduces a regal and national tragedy: “Few would agree that Henry VI, son of Henry V and last king of the house of Lancaster, was one of the least able and least successful kings ever to rule England” (p. 3). Henry was born in 1421, succeeded his father at nine months old and was crowned at the age of eight. By the age of fifteen in 1436, he had put aside regents and was ruling England and its French lands. He was a pious man but his reign has been portrayed as the ‘nadir of the English monarchy”. His reign of thirty nine years was unsuccessful and his personal life had tragic elements of unique proportions for an English monarch. The concise, well-written biography covers the historiographic debate about Henry VI: Was he a king “who made decisions, especially in the areas that interested him, but who left most of the government of the realm to others” or “little more than a puppet with no independent will.” Those are the two ends of the debate among historians. Ross argues that he was more engaged with administration and decision-making than his critics claims but tended to favour the interests of those close to him. His excessive generosity caused political and treasury problems, too. Henry eschewed the kingly aspects of leadership, especially of his armies in defence of the French lands and during the opening period of the Wars of the Roses. He lost all the land gained by his father with his behaviour under great threat showing mental detachment. Examples from the crisis of 1460-1 are that he was captured at Northampton in a tent, recaptured by his wife’s forces while sitting by a tree singing, and at the critical Battle of Towton when fighting the Yorkists, he was ten miles away from the battlefield. A warrior-king he wasn’t. Ross says, “Put kindly, Henry had a deep, sincere and prominent faith; put unkindly, his was an excessive, consuming and compulsive religiosity.” That belief, which led others to work for his canonisation after his death, also appears to have been a barrier to active leadership in peace and war. Henry suffered greatly for his kingship and in 1453 he suffered “an unprecedented mental and physical collapse”. It was a psychological breakdown which left him speechless, almost immobile and unable to perform his role as the king of England. Government of the realm continued with regents and Henry gradually resumed the monarch’s role after 18 months. But the damage to his kingly reputation was great, the Yorkists rose up and he was deposed by Edward IV in 1460-1. Although he went into exile with his wife, he soon returned to England and was captured in 1465 and put in the Tower of London. However, in 1470, he was released when Edward IV fled in the face of increasing opposition and returned to the throne briefly before Edward returned and took custody of the tragic king. Henry was murdered on the night of May 21, 1471. One aspect of Henry’s reign that Ross brings forward is the role of his formidable wife Margaret of Anjou whom he married when he was 24 years old. Her political power and landholdings grew during his reign. She took a greater leadership role at Court after Henry emerged from his breakdown. Margaret organised the armed forces that recaptured Henry at St Albans in 1461. She also lobbied her French relatives to come to her husband’s aid when they went into exile after the decisive Battle of Towton. Their only son, Edward of Westminster, was killed at the Battle of Tewkesbury in 1471, the only English heir apparent to die in battle. Without Margaret’s personal strength, Henry may not have returned after his breakdown or have been able to resume his rule, albeit briefly, in 1471.